Off-the-shelf physical computing uses microcontrollers, sensors, networks, various tools, Linux and design thinking to build gadgets that do interesting jobs. Aesthetics, mechanisms and product packaging are certainly also important areas of consideration when designing a pleasant user experience. Software developers slave over building great onscreen interfaces. Off-the-shelf hardware hackers do the same with the physical gizmo. 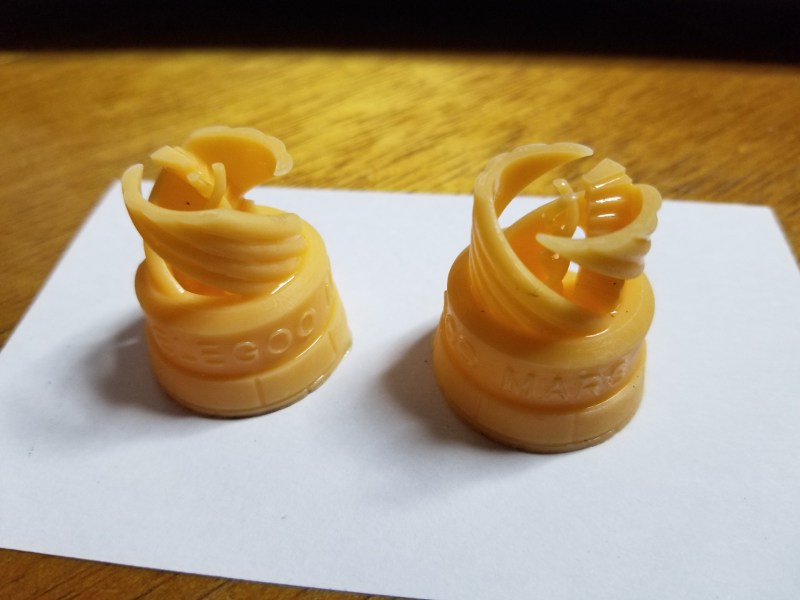 Elegoo recently sent me one of their new resin 3D printers to review. 3D printers are capable of making brackets, gears, cases and a whole host of decorative and functional physical parts. Resin printing uses ultraviolet (UV) photo-curing of the liquid in a vat, masked with a liquid-crystal display (LCD) to form the shape on each layer. This is great because I’d like to expand the column into new areas that help off-the-shelf hackers create their physical computing projects. I also have plans for a new modular Steampunk conference badge that will be snapped and glued together. 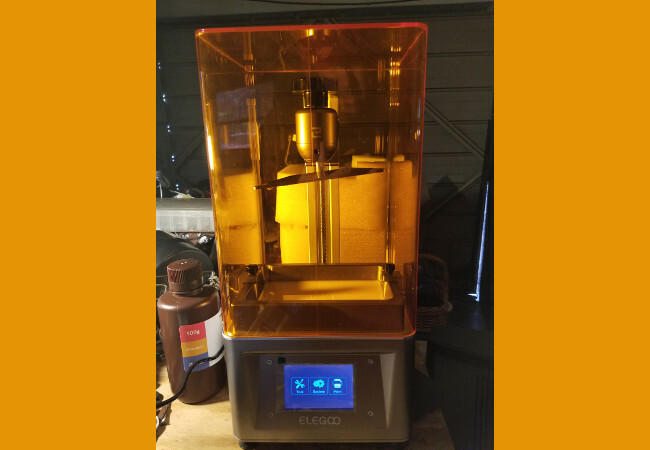 Today we’ll take a quick trip through running a print on the Elegoo Mars printer. The easiest way to test the printer was to use the model included on the memory card that came in the box. The part was a three-inch-tall by one-inch-diameter chess piece. Setting up the printer was pretty simple. After unboxing, I ran the platform down to the bottom position and made sure it aligned with the bottom of the resin vat. Next, I shook up the bottle of resin and carefully filled the vat to about a third full. Next, I plugged the memory card into the USB slot on the back of the machine, selected “Print” and called up the example print from the front-mounted touch screen. A quick push on the right arrow button started the printing operation. One cool thing was that the touch screen displayed a little picture of the mask, as it moves down through the print. It also showed the number of layers, which layer it was printing, total time to print and elapsed time. The print actually had two identical chess pieces side-by-side. Estimated print time for the test piece was a little over four hours. It ran for about two hours before I halted the print. It looked fine, so there was no need to go on to the very end. Thingiverse has a bunch of pre-built models you can download and print. Or, you can create your model from scratch using a computer-aided design (CAD) program. I chose to use the standard example part from Freecad. Freecad is what’s known as a parametric modeler. Not only can you graphically design 3D parts, but you can also change parameters (lengths, sizes, angles, etc.) and the model will be recalculated on demand. It has a built-in renderer so you can see your model as it would look in real life. It can also handle a bunch of different graphical file formats. I exported an .stl file that was then processed for 3D printing. 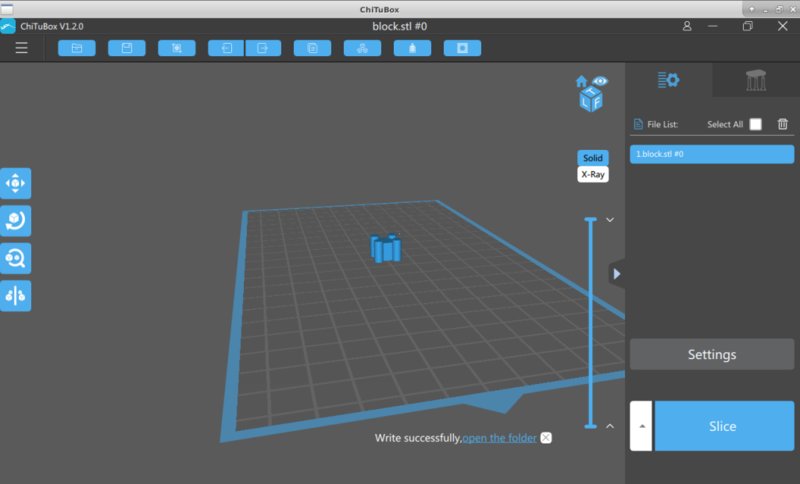 Prepping the 3D model for printing is the job of the slicer. You have to run the .stl file through the slicer before it can be shipped to the printer. The slicer generates a file of layers for printing. The resin printer differs from a traditional filament 3D printer, in that it prints an entire layer all at once in a vat of resin, instead of guiding a hot-end extruder across the X-Y cross-section pattern, one layer at a time. Resin printers can create amazingly detailed prints, with almost no layer lines. Rubber gloves, eye protection and good ventilation are important since the resin can be toxic. 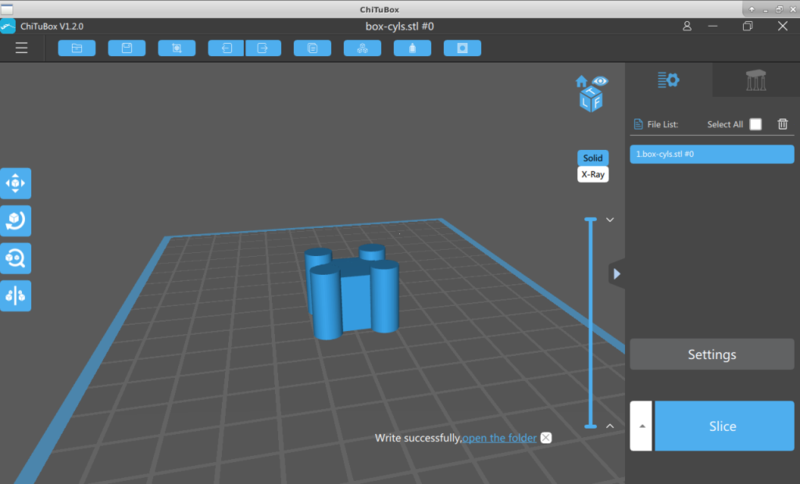 I downloaded and installed the ChiTuBox slicer program for a Linux 64-bit machine. Versions for other operating systems are also available. Elegoo provides the program on the included SD card, as well. Next, I clicked on the “open file” button (upper left-hand button) and pulled my box-cyls.stl file into the program. The part popped onto the grid and I could move the view around with the “ctrl-left mouse button” combination. You can zoom in/out on the part with the mouse wheel. The part was tiny, so I called up the sizing menu using the “circle-cube” button on the left edge of the screen. This menu lets you change the part size in the X, Y, or Z directions. I set the Z size to about 30 mm. 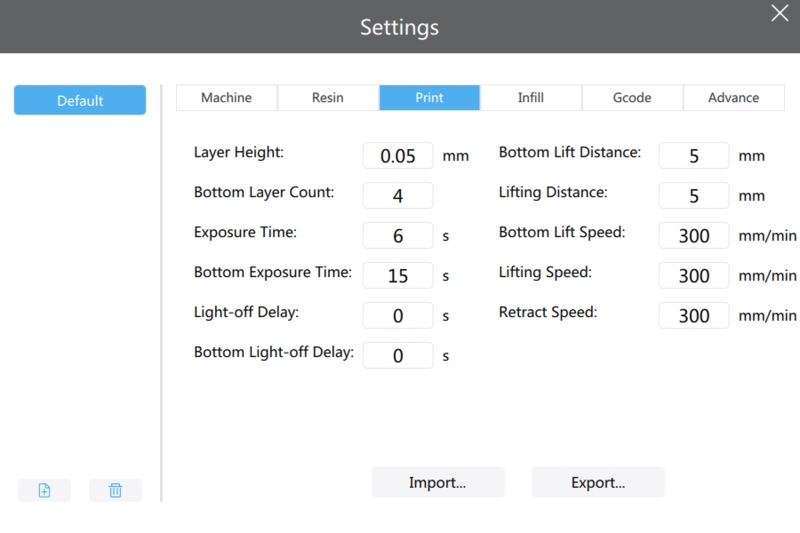 I then clicked on the “Settings” button and then the “Print” tab to check the values. There are a number of values you can adjust to optimize your print. I just went with the defaults. I also clicked on the “Machine” tab and changed the “mirror” setting to “DLP_normal.” A quick click on the X in the upper right corner brought me back to the main program screen. The last task was to hit the “Slice” button, at the lower right, to cut the model into layers. This process took about 10 seconds. A status screen popped up where I could click “Export” and send the results to a file. I called it “box-cyls” with a .cbddlp extension. After the file was written I copied it to a USB stick and plugged it into the printer to produce the actual part. Elapsed printing time for the part was a little over one hour. The results were pretty good. 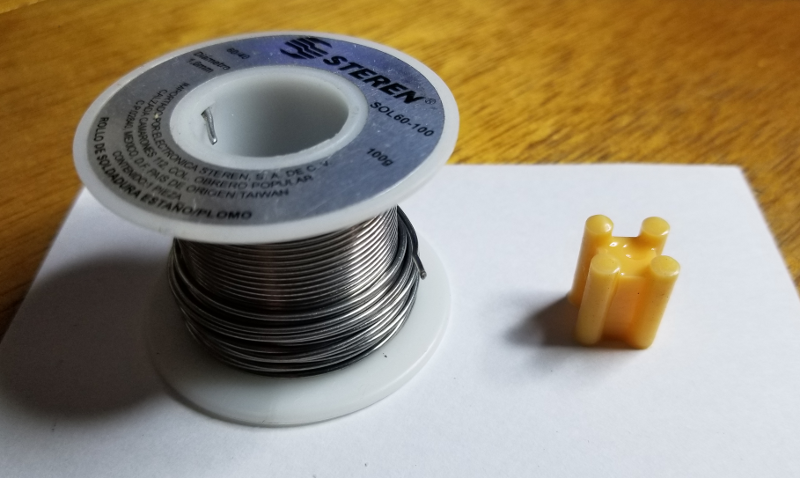 Here’s a picture of the part alongside a roll of solder for comparison. The detail is pretty fine with clean edges and almost no layer lines. Be aware that the uncured resin is considered toxic and should be handled with gloves, eye protection and adequate ventilation. Research on the web for more information about resin printer precautions. You can clean the parts with 99 percent alcohol and leave them out in the sunlight for a few minutes to fully cure. So there you have it. A quick trip through printing a part with a resin printer. As I get more experience with the technology I’ll go into more detail about how to use the machine for physical computing projects. 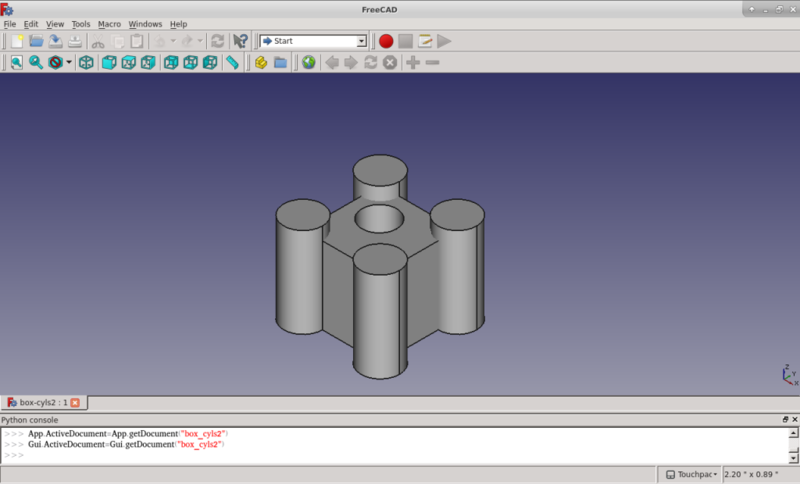 We’ll also delve into 3D modeling using the Freecad program.